The San Francisco Municipal Transit Agency is planning to take its historic cable cars and streetcars off the streets during and after Sunday’s 49ers playoff game. The San Francisco Chronicle reports Muni officials want to protect the cable cars and streetcars from rowdy fans and troublemakers after the Niners win — or lose — in Seattle. Transit officials also say they want to protect riders from hurting themselves. 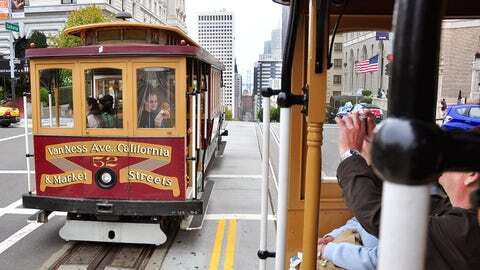 Downtown cable cars and F-Market street cars will not be in service in the afternoon and into the night. Muni’s electric trolley buses will be out of service all-day Sunday. Muni officials say the transit system will use buses on some cable car and rail lines during and after the game that starts at 3:30 p.m.